Ingward, the Guardian of the Seal, is a Character in Dark Souls. 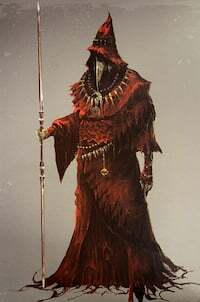 Resides on a rooftop in New Londo Ruins, dressed in crimson robes, he holds a Tin Banishment Catalyst in his right hand and a Ghost Blade in his left. He is the last remaining of the three New Londo sorcerers who long ago undertook the task of guarding the seal; to pay atonement for all who were sacrificed when they sealed away the darkness. Two of the three former healers have since forsaken New Londo, after tiring of their duties. Rumors are that Yulva took her healing arts to Blighttown, what became of the last one is not known. He will cure the player's Curse status for 1 'Liquid' Humanity. If you have none, then use your Humanity item first. He also holds the Key to the Seal, used to drain the valley. He will give it to the player after the Lordvessel is acquired, but he can also be killed for it to drop. He was one of the sorcerers called in to seal away the Four Kings and flood New Londo. On top of the roof in upper New Londo Ruins. He's wearing red. Climb the ladder inside the fireplace to reach him. Talk to him after defeating the Four Kings, and he will move to Firelink Shrine. Important Note: On the PC PTD Edition, killing Ingward is currently bugged, and he may not always drop the Key to the Seal. It is currently unknown what causes this, but the key becomes completely unrecoverable (quitting/loading or visiting the chest in Fire Link Shrine do not work) effectively preventing you from completing the game. Ingward mentions that you should "find Artorias" in order to learn the art of Abysswalking, which seems to indicate that he thinks Artorias is still alive and untainted. This could also suggest that New Londo&apos;s Abyss came before Oolacile&apos;s, especially when you consider that Artorias was a "hunter of Darkwraiths." Not sure if it&apos;s important to the story, but I think it&apos;s a neat detail. And also he gives you the key to the seal. Here ill give you the key to the seal to the four kings of whom I guard.... Really? "Talk to him after defeating the Four Kings, and he will move to Firelink Shrine." Who in their right mind would go back through that ghost infested ruin just to get him to come back to firelink? I just took his humanity with the Dark Hand and it gave me 4, not 3. The third sealer hangs out with a certain favored, yet treacherous, knight. Does killing him matter? He doesn&apos;t really do anything hint fat as I can tell. Buy his spell and murder him then clean up his mess.